How is Rapilose® Gel Used? Rapilose® Gel is very easy to use. Simply twist off the cap, squeeze the gel into your mouth and swallow. Alternatively, Rapilose® Gel can be squeezed inside the cheek, and the outside of the cheek gently rubbed to aid absorption. Each tube can be resealed using the stopper. Rapilose® Gel must never be given to an individual who has become unconscious due to the risk of choking. Everybody's required level of carbohydrate is different. However, the government's National Institute for Clinical Excellence (NICE) recommends 10g-20g of rapidly absorbed simple carbohydrate for the treatment of mild to moderate hypoglycaemia in children and young people. However, if your need for carbohydrate is often greater than 10g, then more than one tube can be used. Rapilose® Gel is particularly useful for keeping in a pocket or handbag, so it's always close to hand when needed. Speak to your healthcare professional or pharmacist about your individual needs. Download the Rapilose® Gel Instruction Leaflet here. Where can I find Rapilose® Gel? 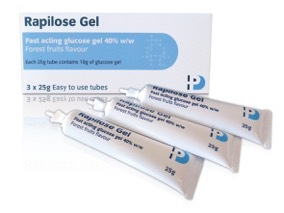 Rapilose® Gel is available on prescription from healthcare advisers and is also available in hospital pharmacies and many independent chemists. Where should I keep my Rapilose® Gel? in your sports kit bag.